This film is available in both VHS or DVD from many sites on the internet. Click HERE to search. In August 2003 Charlie was honored to be filmed for the movie "Gettysburg—Three Days of Destiny,"� produced and directed by international award-winning filmmaker Robert Child. 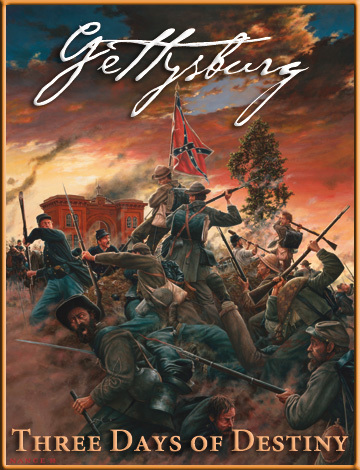 It is the compelling story of the three-day battle of Gettysburg filmed at the spectacular 140th Gettysburg Battle Reenactment. Charlie sings the stirring ballad "Tenting Tonight"� on camera, and his recording of "The Minstrel Boy"� is the anthem played over the credits at the end. Composer Nicolas Palmer providing background music for both songs. Director Rob Child recounts Charlie's involvement in the film this way: "I was speaking with actor Andy Redmond who portrays Father Corby in the film and I said I was looking for a really great Civil War singer, I had someone in mind already but was still seeking someone with certain qualities. Andy recommended I check out Charlie Zahm's web site before I gave him a call. I did just that and was blown away by his voice. It was so powerful, but also very emotional. He also had a great look as I needed someone who would look good on camera in uniform." "I called Charlie right away and explained what I was looking for and he sent me some CDs and even made a special trip up to my home so we could meet in person. You could not find a nicer guy. He is a real gentlemen and has a true sincerity about him. I felt I had found my singer. I was also glad to hear he had done some dramatic work before so he was the complete package. I had an idea of the songs I wanted but I was totally open and encouraged his input. It was a true collaboration. I originally thought I would have him sing "Lorena" in the film, but when I went back to the script the song that really worked was "Tenting Tonight"�as I wanted to convey the sadness of the end of the first day's battle. I knew I would have great camp visuals from dusk and night time that I could mix in with it so it was very well planned. Some people are surprised that I have a singer in the program but they "totally get it." It is beautiful. I wanted to convey the emotion of the end of the first day in a very different way, an unexpected way. I like to surprise people. I don't like to follow any formula for a film, I trust myself to "make things work. "� And if I "feel"� it even though it may be unconventional, then it works. And Charlie really made it work. I had a couple of ideas for a closing credits track but Charlie recommended "Minstrel Boy." I read the lyrics and I thought of course, this wraps things up perfectly. I wanted to continue the Civil War feel and the sentiment of the film and this song really captures it for the audience. In an historical epic you want to keep the "feeling going"� for the audience so they will actually read the credits." ***Charlie Says: Thanks Rob! It was a delight to work with you and to be included in your excellent film!